Adventures in the Endless Pursuit of Entertainment: Oh Mama, Phylicia Rashad in August: Osage County! 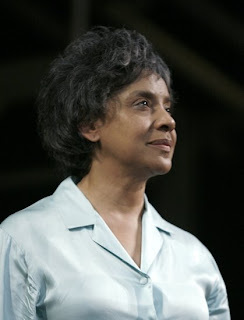 Oh Mama, Phylicia Rashad in August: Osage County! Phylicia Rashad is now playing matriarch "Violet Weston" in August: Osage County and last Saturday night, I had the opportunity to catch her performance. August is the story of a Oklahoma family that comes to together to mourn the loss of its patriarch. As the story unfolds, it soon becomes clear that this is about more than just a tale about a death in the family. When I heard Phylicia would be going in to the Pulitzer and Tony winning August, arguably one of the greatest American plays written, I was uber excited. She's one of my favorite stage actresses - I saw her brilliant performances in A Raisin in the Sun, Gem of the Ocean and Bernarda Alba. I also saw her in Cymbeline (not brilliant but wonderfully fun and practically campy - and John Cullum who played her husband there, is also the patriarch here). Phylicia has had some experience with motherhood, both in real life and in acting. But Violet is in the league of mothers from hell - think Joan Crawford as portrayed in Mommie Dearest or "Mrs. Iselin" in The Manchurian Candidate. Even though Violet is a woman from a small town in the plains of Oklahoma, and presumably white I might add, I thought if anybody could pull it off, it would be Phylicia. On tv and even as a celebrity, Phylicia comes across as regal and elegant, the exact opposite of Violet Weston. In Raisin, Gem (especially) and Bernarda, she transformed her off-and-on-stage personality to become those characters and she's done it again here. Indeed, here she is spectacularly transformed to practically unrecognizable. In the first act, just after her daughter "Barbara" has returned home to await news of her father, Violet says, "I'm just so scared". This is an ominous line. Because what is to come is very, very scary. I saw the original cast of August perform three times. Each time I was stunned and thrilled by their performances, particularly Deanna Dunagan who originated the role of Violet and won the Tony for Best Leading Actress in a Play. The thing about Deanna, and the rest of the cast, especially Rondi Reed, who also took a Tony for her turn as "Mattie Faye", that really got me was that reminded me so much of my own family. Not the fighting, drugs, or dysfunction, but their mannerisms. But Phylicia didn't remind me of home at all. This time I was completely enthralled at the story that unfolded at the same time as being shaken by the characters. She completely inhabits this wretched woman "Violet". She was at once strong but weak, a victim of her own upbringing, her own failures and her own attempt to control situations, egged on by an addition to prescription pills. Phylicia's timing is perfect. During the second act, there's a funny, and one of the only light-hearted, scene between Violet and her sister "Mattie Faye", now being played beautifully by Elizabeth Ashley. They are reminiscing and just cutting up the way sisters do. It is practically miraculous that in less than 2 weeks of performances they have already managed to play it as though they have been playing it a year together. She later has this perfection in timing with Barbara, who is played by the incredible Amy Morton (from the original cast), but on an entirely different plane of action. Then it's on to an extended family dinner and it's really time to be very afraid. It becomes not just a family drama, but a horror story. Phylicia's Violet wastes no time in putting the fear in to her family or the audience. Her biting delivery is shiveringly cold and vicious. By the time the dinner is at its fateful end, Violet screams, "I'll eat you alive, girl!" to her daughter Barbara. I thought, "My God, it's really going to happen!" Then came the third act. Phylicia showed an entirely different ego here. Her Violet became devastatingly pitiful. I ached for Violet's pain and loneliness even while loathing her for her inability to overcome her selfish self-destructiveness. Phylicia Rashad's giving a powerhouse performance as Violet. She proves that this is one of the greatest of roles and goes on to claim it for herself with extraordinary ferocity . Go see her in August: Osage County with a broadwaybox discount. It's at the Music Box Theatre on 45th Street and tickets are on sale at least until September 6th. Photo by Walter McBride/Retna Ltd.